For hiking enthusiasts who seek spectacular views and challenging, high alpine summit ascents but do not desire technical climbs, run - don't walk - to the Sawatch Range of central Colorado. Central Colorado's Sawatch Range includes Mounts Elbert and Massive, the second and third tallest peaks in the United States. The range boasts fifteen peaks over 14,000 feet. Rivers with headwaters in the range's rocks include Roaring Fork, Arkansas and Gunnison Rivers. Towns along the range include Vail, Aspen and Gunnison, CO.
For information on northern region: San Isabel National Forest, Leadville Ranger District (719) 486-0749. Central region: White River National Forest, Aspen Ranger District (970) 925-3445. Southern region: Gunnison National Forest, Gunnison Ranger District (970) 641-0471. 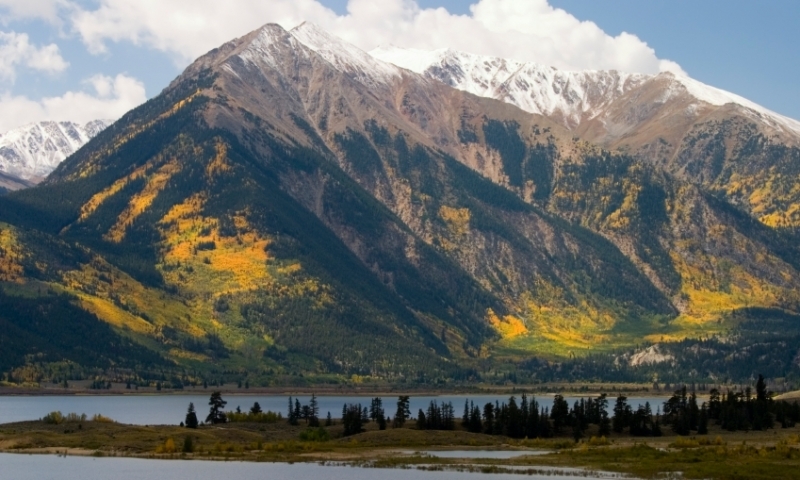 Backpacker's seeking a hiking paradise should look no further than Colorado's Sawatch Range. This narrow spine of mountains, located along the Continental Divide, contains fifteen "14ers," summits higher than 14,000 feet, as well as more than 300 peaks above 12,000 feet. The peaks of the Sawatch Range include the "Collegiate Peaks," such as Mounts Princeton, Harvard and Columbia, and Mount Elbert, the tallest peak in the Colorado Rocky Mountains. Visually, the Sawatch Range appears quite impressive, conjuring images of harrowing alpine ascents. In truth, however, an adventure to summit a peak in this range does not require expert mountaineering skills. Many approaches to summit can be made by well-prepared novices, making this specatacular range an endless trove of mountain hiking treasure. U.S. Highway 24/285, south of Interstate 70, parallels the Sawatch Range from Vail to the town of Saguache, CO, in San Luis Valley. Many of the mountain peaks are located within White River, San Isabel and Gunnison National Forests. On the eastern side of the range, one can find the headwaters of Arkansas and Eagle Rivers, to the west, Roaring Fork and Gunnison Rivers, among many other rivers, creeks and streams. Independence Pass (Hwy 82) traverses the range from Twin Lakes, CO, west to Aspen, and to the south, Monarch Pass (Hwy 50) traverses from Monarch to Sargents, CO. The high season in the mountains would certainly be, for the majority of outdoor adventurers, the summer months of July and August, when much of the snow has melted at high altitudes. The Sawatch Range does, of course, provide winter ascents for those who appreciate ice climbing and ski mountaineering. Regardless of season, those who set off into the high climbs of this range should prepare for drastic changes in weather and the worst of scenarios; snow in July should not come as a surprise. Take your pick: Hiking, climbing, and mountain biking in the mountains, or fishing and boating in the valley. The Sawatch Range, located on protected wilderness lands, has seemingly-endless systems of maintained trails allocated for use by hikers, bikers and horseback riders. The rivers located in proximity to this range lay claim to some of the best trout fishing in the country. The Fryingpan River, north of Aspen, carries gold medal status, the highest attainable, for brown, rainbow and cutthroat trouts. For information regarding recreation in the central region of the range, contact White River National Forest at the Aspen Ranger District office by calling (970) 925-3445; for the northern region, contact San Isabel National Forest's Leadville Ranger District office at (719) 486-0749; and for the southern region, contact Gunnison National Forest at the Gunnison Ranger District office at (970) 641-0471.